"Books from AAP's members encourage kids and young adults to explore worlds beyond their own and understand cultures, concepts they wouldn't have otherwise. As stewards of a democratic society, publishers help ensure that these young minds have the freedom and access to read books of their choosing." Books & Books at the Studios of Key West reopened yesterday after being closed more than two weeks because of Hurricane Irma. The store suffered only minor damage (one window and few dozen books), however, it needed to remain closed until power was restored and roads were reopened so evacuated staff could return to the island. The store is open from 10 a.m. to 3 p.m. until tomorrow, when regular hours--10 a.m. to 6 p.m.--will resume. 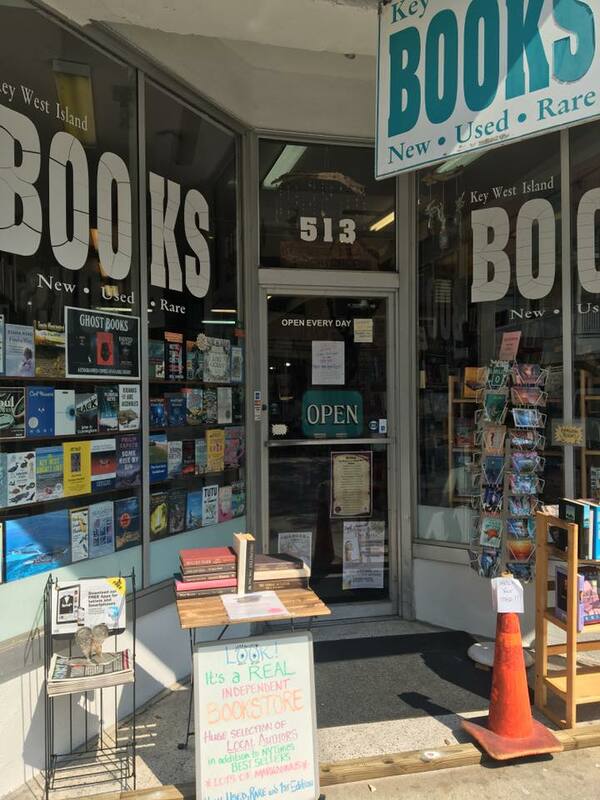 Also on Key West, Key West Island Books is up and running, but facing some problems, as owner Suzanne Orchard outlined on Facebook. Although the store had no structural damage, unexpected expenses have included $1,100 to board up the bookstore before the hurricane and an unknown amount in repairs for the air conditioning, which hasn't worked since the storm. At the same time, the store was closed for two weeks, and business hasn't bounced back yet because no tourists are in town and the locals have no income, or much less income, as businesses slowly reopen. 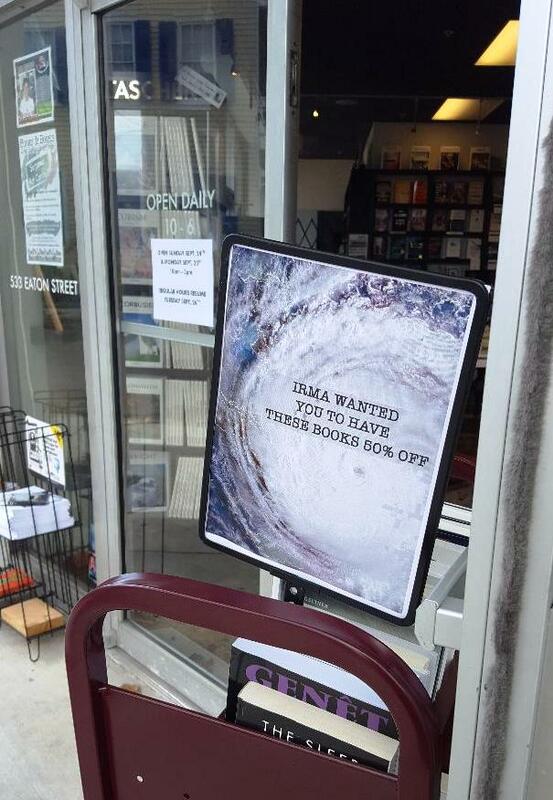 And unfortunately the store has been denied any aid from FEMA. So as Orchard noted, "we need some help." But she said firmly, "I cannot, in good conscience, accept a handout." So she's suggesting friends and supporters buy gift certificates. "The purchase of a gift certificate NOW will help me with some unexpected expenses and you'll have new books to look forward to! Gift certificates are available in any amount, they NEVER expire, they can be used for new books, used books or special orders. They ARE transferable. I will ship books, too!... I'll send you your certificate right away, you redeem it on your next visit, even if it's a year or more from now." To purchase a gift certificate, call 305-294-2904 or send an e-mail. She added: "Key West is improving exponentially every day. In a few more weeks, we'll be back to the zany island town you know and love, albeit less green and lush. Thank you, thank you, thank you for all your messages and warm wishes. Hearing from my customers kept my heart light as the winds increased and things got scary. I'm telling you, I felt the love! It helped more than you know. I cherish my customers! You've become my friends and I'm so grateful for all of you." The American Booksellers Association made an emergency contribution of $5,000 to the Book Industry Charitable Foundation (Binc) for hurricane relief and promised to match all bookseller contributions to Binc, up to $5,000, between August 31 and September 15. Last week, ABA said that the matching goal had been reached so that it was donating another $5,000 to the organization. "The book industry does have the best people, that's for certain," Binc executive director Pam French told Bookselling This Week. "Folks just started to step up and say, 'Hey, how can we help?' We were pretty sure that we could achieve the ABA match without counting the contributions from publishers, and we were right. All the funds that contributed toward the $5,000 ABA match came either directly from bookstores themselves or from bookstore employees." French added that Binc has processed aid relief for nine families already and is getting at least one request a day. "On Friday [the 15th], I got three requests from Florida just for immediate needs--food and water--so we sent out American Express gift cards overnight so they could get those immediate needs met. Luckily, in those cases, everybody was safe and they had their own home to go to, but they had no power, so they were buying ice and small amounts of food because everything in their refrigerators was rotting." Last week, Barnes & Noble said it is donating $1 million worth of books to First Book for areas affected by hurricanes Harvey and Irma. The donation features thousands of children's books, including chapter books, board books, picture books and coloring books. First Books will deliver the books to schools and local charities in Texas and Florida. "Barnes & Noble is committed to the communities it serves across the country, and when natural disasters of this magnitude affect our customers and booksellers we feel a duty to help," said B&N CEO Demos Parneros. "We hope that by partnering with First Book to put books in the hands of children in affected areas, we can help brighten the outlook of some of the families who lost the most in these unprecedented storms." First Book president and CEO Kyle Zimmer thanked B&N "for stepping up and making a significant difference at a time of need for so many children and families in our country. These books will be distributed to schools and charities that require the most help in both Texas and Florida. Since Hurricane Katrina, First Book has already distributed more than five million new books to areas affected by natural disasters, and we've seen firsthand how books can improve the lives of young people, even in the most difficult circumstances." 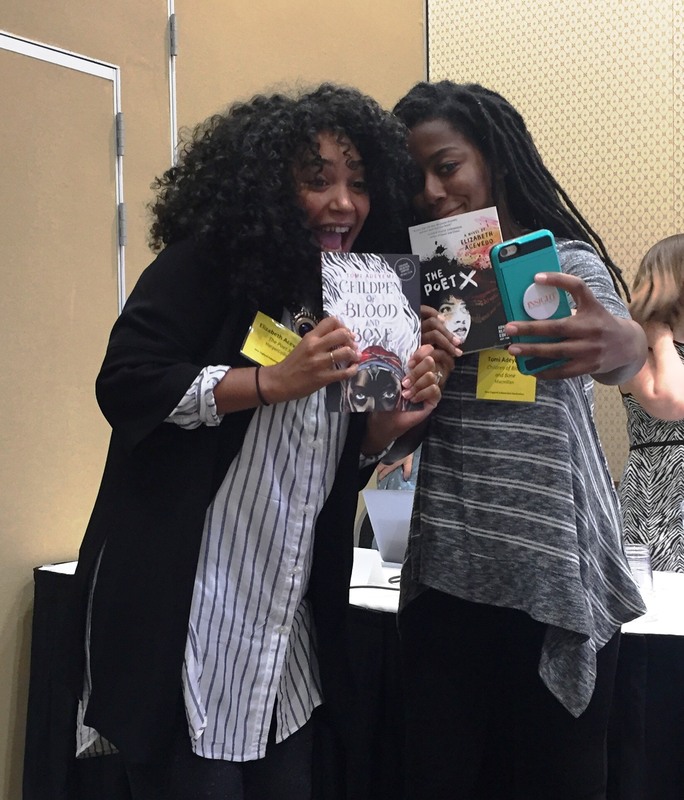 At NECBA's Signing to Signings panel: Elizabeth Acevedo and Tomi Adeyemi pose with each other's new books. One example: the Windows and Mirrors Project, an annual list created by a NECBA committee to honor books that exemplify diverse viewpoints, experiences and identities. The books chosen by this year's committee--which included Robin Gross from Books on the Square, Providence, R.I.; Zazu Galdos-Shapiro of The Bookloft, Great Barrington, Mass. ; Alex Schaffer from Brookline Booksmith, Boston; Rebecca Wells from Porter Square Books, Somerville, Mass. ; Beth Wagner of Phoenix Books, Essex, Vt.; and Sara Hines from Eight Cousins Books, Falmouth, Mass.--were presented at the NECBA Picks session by NECBA co-chairs Sara Hines and Beth Wagner. (Here is 2016's list.) They also unveiled the project's new logo, created by author and illustrator Grace Lin. At the children's author breakfast: author Matt de la Peña and author/illustrator Loren Long presenting Love, their forthcoming book from Penguin. The Children's Author and Illustrator Breakfast featured five authors with upcoming titles. In a surprisingly touching (and unsurprisingly funny) presentation, Matt de la Peña (Last Stop on Market Street) and Loren Long (Good Day, Good Night) shared their new collaboration, Love (Penguin, January 16, 2018). Justina Ireland spoke passionately about her upcoming book, Dread Nation (Balzer + Bray, April 3, 2018), and weeding out the roots of systemic racism in the children's literature community. She said Dread Nation purposefully features a heroine all readers can believe in, but who young girls of color especially may see themselves in. Holly Black (The Darkest Part of the Forest) described her new work, The Cruel Prince (Little, Brown, January 2, 2018), as a "strange juxtaposition of the unreal and the very real"--"magic and milk bottles." A "reverse changeling story," Black's work focuses on two human children trying to find their place in a fairy court. At the New England Book Awards banquet, Mackenzi Lee, winner of the Young Adult New England Book Award for The Gentleman's Guide to Vice and Virtue (Katherine Tegen Books), gave an energetic speech expressing her love for the indie bookseller community and saying, "part of my job as a writer of historical fiction for teens is... telling them... that people like them have always existed. Not only always existed, but they have lived and loved and triumphed and been part of the narrative." The winner of the Children's New England Book Award was Melissa Sweet (Some Writer!, HMH Books for Young Readers), who was unable to attend due to a scheduling error. 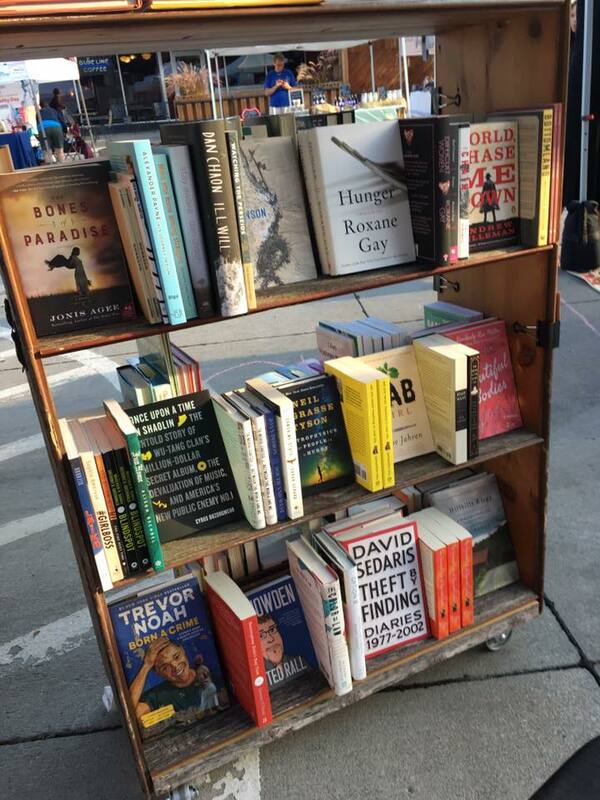 Nicole and Ted Wheeler's Dundee Book Company mobile store in Omaha, Neb., opened last month as "a roving bookstore that consists of a single cart made from rescued barn boards," the World-Herald reported. "The shop pops up a few times a month at various Omaha events, selling a curated collection of literary titles, often with an emphasis on local authors." They recently set up shop at Pageturners Lounge. The Wheelers had long wanted a neighborhood bookstore and considered opening one. "As a joke, we sort of scouted out retail spots for bookstores," Nicole Wheeler said, noting that they they couldn't "quit our day jobs; that's crazy." Dundee Book Company was the "think smaller" solution. "The whole (publishing) industry is embracing it as this weird, cool thing," Nicole said of the pop-up movement. "It's kind of catching on.... It's interesting to see people's reactions to it. It's almost more of a social or art experiment." Would they ever want to open a bricks-and-mortar shop? "Maybe someday," Ted Wheeler said. Haiyan Xu, a Chinese science fiction translator whose pen name was denovo, died on September 6 in a diving accident, author Ruhan Zhao reported on Facebook. She was 39. Xu was a genetic scientist who received a Ph.D. from Columbia University and who translated William Gibson's Neuromancer, Charles Stross's Singularity Sky, Robert A. Heinlein's The Man Who Sold the Moon and Methuselah's Children, a range of short stories and novellas by Nancy Kress, and more. Image of the Day: Happy 30th, Sourcebooks! 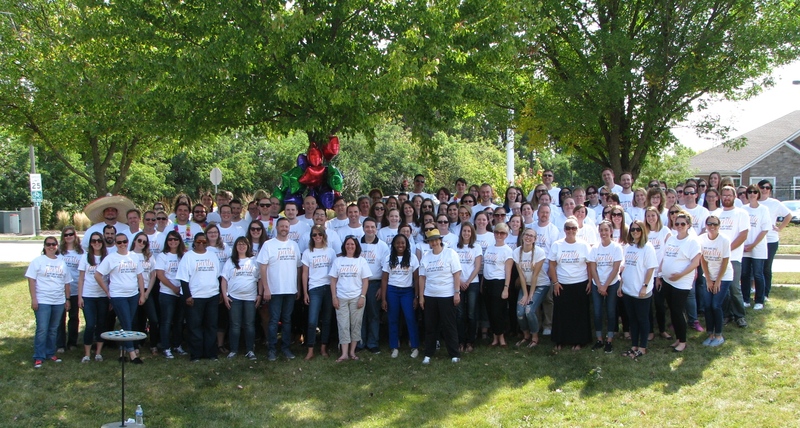 Sourcebooks celebrated its 30th anniversary with a party at its Naperville, Ill., headquarters on Thursday. Pictured are more than 100 of the "amazing people who create books that transcend categories and defy odds, have been honored with hundreds of national bestsellers and awards, and connect with readers in new and innovative ways. We like to party. And by party, we mean, read." "Ann Patchett doesn't just write books, like her latest bestseller, Commonwealth; she sells them," CBS Sunday Morning observed on yesterday's program, which featured Patchett giving 60 Minutes correspondent Lesley Stahl a tour of Parnassus Books in Nashville, Tenn., the store that Patchett co-owns. "As you might expect from a novelist, there's a good story behind Parnassus Books, and it's one that's bigger than just one brick-and-mortar retailer," CBS Sunday Morning noted. The story had its roots at Winter Institute 2017, when Patchett conducted an interview of Stahl on the occasion of the publication of her book Becoming Grandma. At one point, Patchett pitched Stahl on a 60 Minutes story about independent bookstores and "about this industry and how surprisingly successful it is." 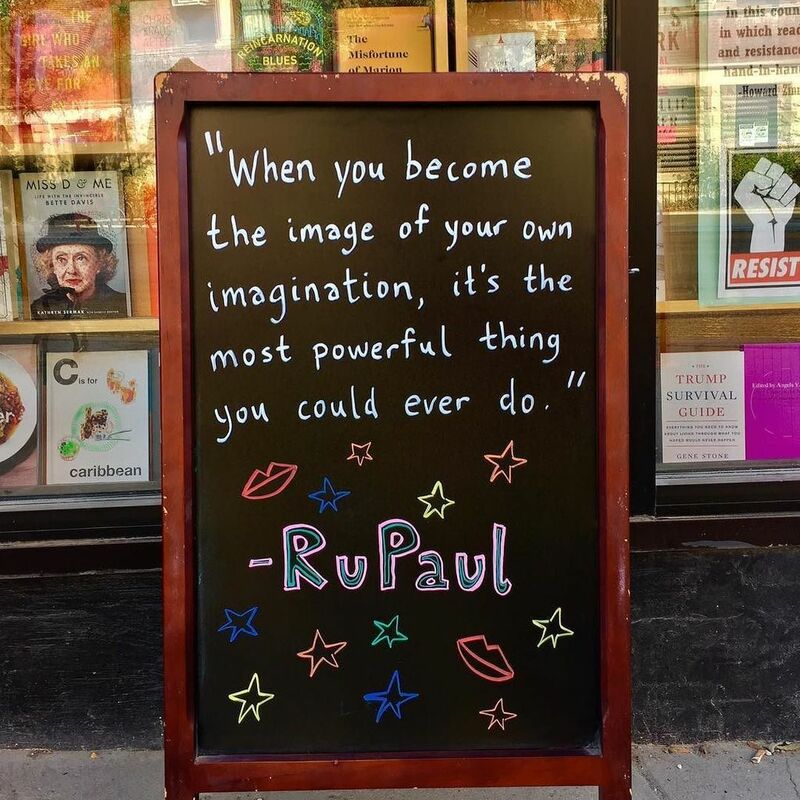 Showcasing its sidewalk chalkboard on Twitter recently, Unabridged Bookstore, Chicago, Ill., tweeted: "RuPaul for Prez 2020." Effective October 11, Sandra Law is joining Abraham Associates as the firm's new sales rep for Indiana, Michigan, Ohio, and some Chicago stores. She is taking over for Roy Schonfeld, who is retiring at the end of the year. For the last three years, Law has been the store manager at Anderson's Bookshop in La Grange, Ill. Before that she was a store manager at H&M, and a manager and bookseller at Mitchell Books in Fort Wayne Ind., and Barnes & Noble. Aubrey Churchward has been promoted to publicist from associate publicist. Vanessa DeJesus has joined the company as associate publicist. She was most recently assistant manager of author events at Macmillan. Jasmine Hodge has joined the company as publicity assistant. Effective October 2, Nicole Benevento will join the company as marketing & publicity assistant. 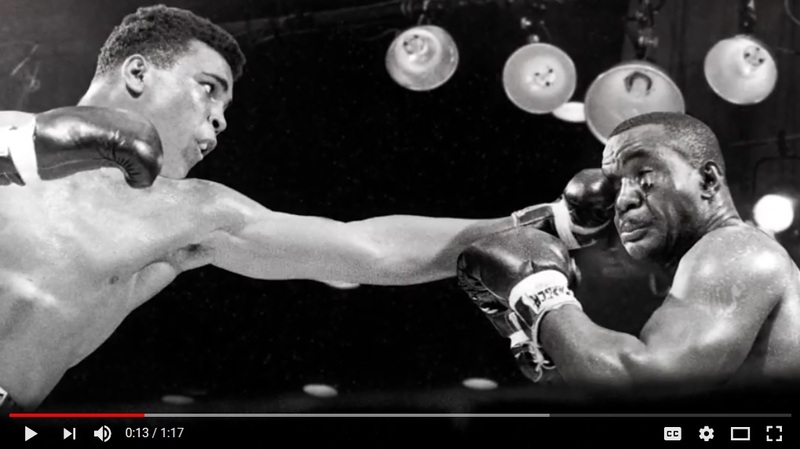 Ali: A Life by Jon Eig (Houghton Mifflin Harcourt). Fresh Air: David Litt, author of Thanks, Obama: My Hopey, Changey White House Years (Ecco, $27.99, 9780062568458). Harry: Candace Cameron Bure, author of Staying Stylish: Cultivating a Confident Look, Style, and Attitude (Zondervan, $22.99, 9780310088059). CNN International's Quest Means Business: Ray Dalio, author of Principles: Life and Work (Simon & Schuster, $30, 9781501124020). Daily Show: Katy Tur, author of Unbelievable: My Front-Row Seat to the Craziest Campaign in American History (Dey Street Books, $26.99, 9780062684929). Good Morning America: Stephen King and Owen King, authors of Sleeping Beauties: A Novel (Scribner, $32.50, 9781501163401). Today Show: Mehmet Oz, author of Food Can Fix It: The Superfood Switch to Fight Fat, Defy Aging, and Eat Your Way Healthy (Scribner, $29.99, 9781501158155). He will also appear on Rachael Ray. CBS This Morning: Art Garfunkel, author of What Is It All but Luminous: Notes from an Underground Man (Knopf, $27.95, 9780385352475). CNBC's Closing Bell: Jordan Belfort, author of Way of the Wolf: Straight Line Selling: Master the Art of Persuasion, Influence, and Success (North Star Way, $26.99, 9781501164286). Late Show with Stephen Colbert: Ken Burns, co-author of The Vietnam War: An Intimate History (Knopf, $60, 9780307700254). Last Call with Carson Daly: Eddie Izzard, author of Believe Me: A Memoir of Love, Death, and Jazz Chickens (Blue Rider, $28, 9780399175831). Daily Show: Kathryn Miles, author of Quakeland: On the Road to America's Next Devastating Earthquake (Dutton, $28, 9780525955184). A trailer has been released for Peter Rabbit, Sony Pictures Animation's "irreverent, contemporary comedy with attitude." Indiewire reported that the star of Beatrix Potter's many tales "about a darling family of anthropomorphic garden dwellers is now the recipient of his very own hybrid origin story, one that features no less than James Corden voicing the fluffy bunny. And no, he's still not wearing any pants." The voice cast also includes Domhnall Gleeson, Rose Byrne, Margot Robbie, Elizabeth Debicki, Daisy Ridley and Sam Neill. Margot Lee Shetterly has won the $13,000 2017 Grateful American Book Prize for Hidden Figures: The American Dream and the Untold Story of the Black Women Mathematicians Who Helped Win the Space Race (HarperCollins), which was the basis for the Oscar-nominated film of the same name. David Bruce Smith, co-founder of the prize, commented about the book's subject: "They were called 'computers' where they worked and were largely dismissed until the authorities at the space agency's Langley Memorial Aeronautical Laboratory in Virginia realized that their help was indispensible if the U.S. was to prevail over the Soviet Union in the conquest of space. Despite the rampant racism of the times, four mathematicians, Dorothy Vaughan, Mary Jackson, Katherine Johnson and Christine Darden, showed they had the right stuff. Using primitive tools by today's standards--pencils and adding machines--they calculated the trajectories that would successfully launch America's first astronauts into outer space." Dreamland Burning by Jennifer Latham (Little, Brown Books for Young Readers), about the Tulsa race riot of 1921. The Story of John Quincy Adams 250 Years after His Birth by Edward Cody Huddleston (Atlantic Publishing Group). Awards will be presented on October 12 at a reception at the National Archives in Washington, D.C.
Finalists in the 61 categories of the 2017 New Mexico & Arizona Book Awards have been announced and can be seen here. Winner will be announced at a dinner in Albuquerque, N.Mex., on November 17. In addition, the Friends of New Mexico Books Award is being presented to Jill Lane, director of the Anderson-Abruzzo Albuquerque Balloon Museum Foundation. She is an author, partner with Travelin' Jack and "was the force behind" the Chama Book Fair and the current Balloon Museum Holiday Book Fair. The New Mexico Literary Award is being presented to Janet and Art Brennan, founders of Casa de Snapdragon publishing company in Albuquerque. They have been active members of the New Mexico Book Association, PubWest and the New Mexico Book Co-op, helping New Mexico Books and authors. Pamela Bannos, a professor at Northwestern University, frames a fascinating portrait of Vivian Maier, the mysterious nanny who was also a gifted self-taught photographer who chose to remain unknown. The biography also examines the astonishing circumstances and coincidences by which Maier's photographs emerged into the public eye and her meteoric posthumous rise in the art world. By tracing Maier's 82 years of life through New York and Chicago and her trips abroad--and by studying Maier's accomplished photographs in depth--Bannos pieces together clues about the woman behind the camera, dispelling myths that have been perpetuated and shaped since her death in 2009. Vivian Maier was--and continues to remain--an enigma. Eccentric, fiercely independent and intensely private, she was born illegitimately in Manhattan to a French mother, whose own birth was illegitimate. Both Maier's mother and grandmother were live-in servants. That paved the way for Vivian, throughout her adult life, to work as a nanny for several well-to-do U.S. families. This enabled her to support herself while also secretly pursuing her craft as a visual artist, in earnest, for decades. Those closest to her--mostly her employers and their children--knew that Maier liked to take photographs, yet no one knew the true extent of her passion and drive--and the scope of her talent. Bannos firmly believes that Vivian Maier's confident and informed photographs "reveal her footsteps; they demonstrate evolving strategies and disclose her access to places and milieus." Maier focused on nuanced interactions and recorded street scenes and people, mostly strangers, who caught her eye. Beyond the aesthetic appeal, her photographs are thought provoking and often playful. Nevertheless, she carefully protected her work and never shared it. She seemed "to have been less interested in selling or showing photographs than in taking them." It was only near the end of Maier's life--when she was neglected by the world, infirm and shuttled between hospitals and nursing homes--that her work was discovered. With no living relatives, she lapsed in paying the rent on five storage lockers in Chicago. The abandoned contents of her life as a hoarder--an overwhelming accumulation of books, magazines, reels of film, photographs, thousands of negatives and more than 1,000 rolls of undeveloped film--were put on the auction block. Her belongings were dispersed to bidders, scattered into small lots; her archive of work, fractured. The accounts of these beneficiaries and their interest and support of Maier's work--how they ultimately launched her photography into an international phenomenon, personally profiting millions from her stunning work--are as intriguing as Maier's mysterious life story. Bannos's engrossing, meticulously researched biography sensitively reconstructs Vivian Maier's very private life in conjunction with her now massive public legacy as a visionary photographer. Many questions remain and always will. 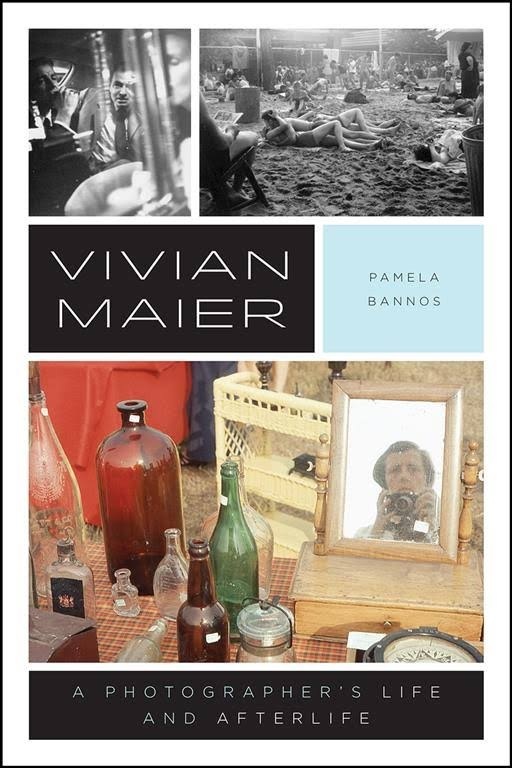 However, Bannos's comprehensive narrative ensures that Vivian Maier's story and the treasure trove of her work will live on, transcending the world of photography. --Kathleen Gerard, blogger at Reading Between the Lines. Shelf Talker: A fascinating glimpse into the life of an eccentric, legendary photographer whose work came to prominence only with her death.